We offer a wide range of iPhone 7 Plus repairs get in touch with us for a fast reliable repair. The iPhone 7 Plus is the 10th generation iPhone, and was released to specific markets between September 2016 and November 2016. We offer screen repairs, battery replacements, liquid damage recovery, speaker replacement, charging socket repairs and more for the iPhone 7 Plus. The price you see is the price you pay so why wait, all repairs are covered by our 'No Fix, No Fee' policy alongside our 6 month warranty. All our fast iPhone 7 Plus repairs include VAT. Our repair services are suitable for the 32GB iPhone 7 Plus, 128GB iPhone 7 Plus, and the iPhone 7 Plus 256GB, iPhone Model Numbers A1661, A1784 and A1785. 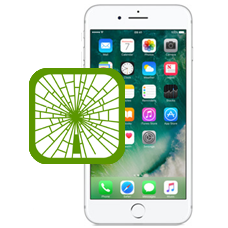 If you have broken your iPhone 7 Plus screen we can help, maybe parts of the image are missing on the iPhone 7 Plu..